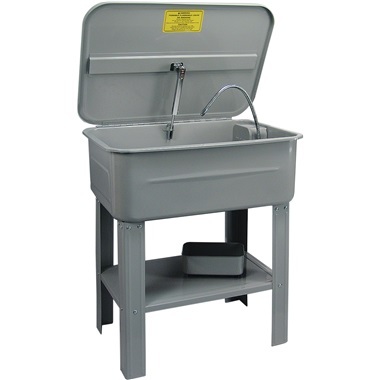 Our 20-gallon parts washer (12-gallon solvent capacity) features a 1-piece seamless-constructed steel tank and spring-loaded lid with fire link. ("Seamless" means no leaks or unexpected weld problems; lid with fire link melts in case of fire and automatically closes). Also, powerful 115 volt pump with on/off switch recirculates cleaning solution from tank through chromed flexible metal spout and onto parts. Remove oil, sludge, grease, or grime fast! Quickly and safely clean internal engine components, manifolds, water pumps, heads, carburetors, oil pans, valve covers, transmission parts, etc., plus many other uses ... it's great for removing unwanted buffing compound from newly buffed parts. Perfect for small service and home shops! Complete with legs, parts-drying shelf, flexible spout, and built-in drain plug for quick and easy removal of cleaning solution. Has removable internal shelf for soaking parts. For small parts such as springs, nuts & bolts, valves, and pushrods, a parts-soaking basket is included. 20 gauge, powder-coated tank. Tank Size: 28"w, 19"d, 10-1/2"h. Overall Size: 30-3/4" wide, 21-3/4" deep, 35-3/4" high. Dim. Ship Wt: 78 lbs. Fabricating my own barrel type parts washer; TP was the only place I could find that carried this necessary part. I haven't completed the project yet, but the nozzle appears to be well made. I bought a used solvent tank and the spout was damaged. This one fit the bill perfect. Service & Delivery comments: Delivery was prompt. My parts washer came with a parts list but failed to include any contact information for the manufacturer. When I saw this spout, it looked exactly like the one that came on my parts washer and it was the same. It fit perfectly and the price was very reasonable. Service & Delivery comments: Delivery was speedy.